Dr. Michael Cannon is a research epidemiologist at the National Center on Birth Defects and Developmental Disabilities at the CDC. He conducts research on the prevention of birth defects, with a particular focus on congenital cytomegalovirus. Congenital Cytomegalovirus (cCMV) is the most common congenital infection in babies in developed countries. Pregnant women who contract cCMV can pass the virus onto their unborn baby, which can result in multiple disabilities, including significant hearing loss, vision loss, small head size, lack of coordination, and seizures. 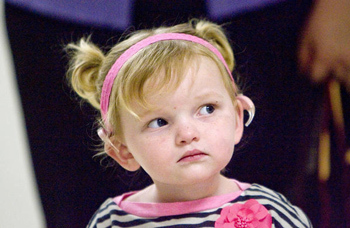 In fact, Ross and Fowler (2008) estimate that cCMV is responsible for 15%-21% of hearing loss in children. During this webinar, Dr. Cannon will be providing an overview of cCMV from prevention to diagnosis and treatment. Though the effects of cCMV have been known for more than 20 years, many people are still unaware of the virus and its negative effect on unborn babies With your help, we can reduce the number of babies born with cCMV. Help spread the word about cCMV.